I was first introduced to the art curriculum put out by ARTistic Pursuits Inc. at a homeschool conference over a decade ago. I loved what I saw, but finances were tight and my oldest kids weren't all that enthused about art, so I put it on my "someday" list of things I wanted to try. One thing I distinctly remember about Brenda Ellis (who I spoke to at that booth) was how encouraged I felt when talking to her, even though I didn't purchase a thing. A couple of years later, I purchased a level and never really used it. Then I had the chance to review one of the books, and we really loved that. That review is of an older version of the program, and I have to say that I really love the updates done since then. 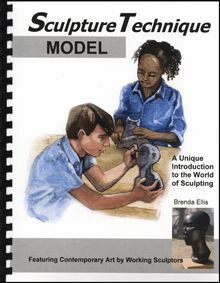 Recently, Brenda has come out with a new series though -- Sculpture Technique Model and Sculpture Technique Construct. 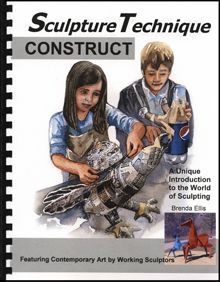 These Sculpture Technique books are intended for grades 4+, which is perfect for me, as my youngest is a 4th grader. It seemed like a perfect time to try these particular books. What has been really fun is that we're doing an art co-op weekly, which involves nine kids ages 5-15. Doing this as a group has been phenomenal. We started our sculpture experience with the Model book, in the very first unit which has us using putty in a variety of ways. The first project had the kids making small pieces by molding the putty a lot like they would any sort of clay. The next two projects involved building a form out of cardboard, paper, and masking tape, and then basically painting a thinner putty mixture over the form. These projects were fun, especially once the moms figured out how to get the texture right. We had some pretty amazing projects, and some really great discussions in my family about static (non-moving) forms vs. forms that show movement. Other sections in this book include one using clay, where there are four projects; and one on wool felting, where there are five projects. The first two photos are of the project showing movement. The cross was molded like clay. 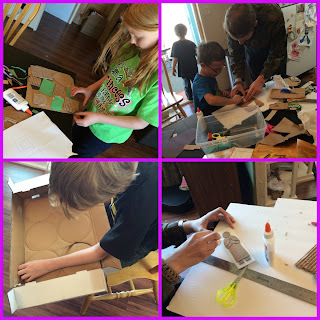 After working on the putty, we switched books and did the cardboard projects in the Construct book. For the first project, we used trash. Cardboard boxes of various sorts, some of which we peeled to reveal the corrugated parts, some of which was used just as it was. The very first project is talking about planes -- so they were assembling flat shapes on a background of either paper or cardboard. 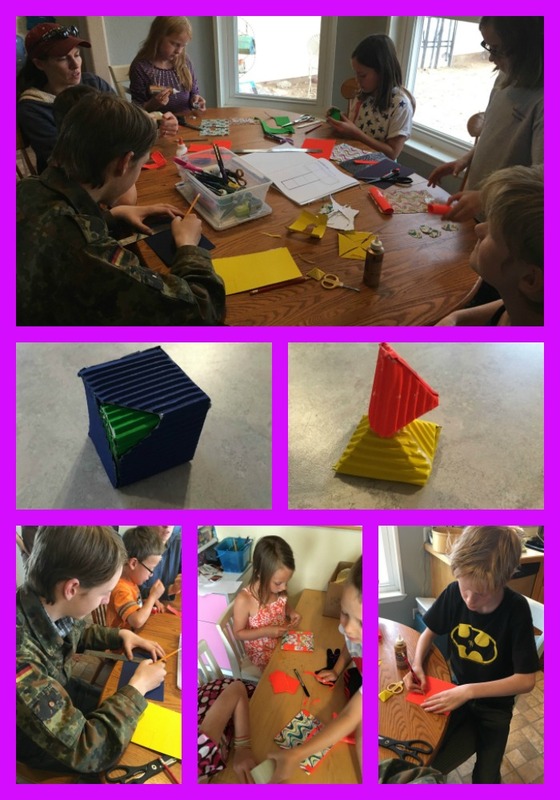 In the photos here, you can see Trina assembling different sized and colored rectangles, Richard cutting out a circle, Thomas helping one of the 5-year-olds, and the figure that Thomas created. The second project had us going 3D by creating forms. For that, we did purchase corrugated paper in solids and prints. The younger kids understood the concepts, and with help they were able to assemble some solid shapes. The third project, which we'll be doing on Wednesday, has them constructing an architectural model. My 15-year-old is plotting just what he is going to do. Other sections in this book include making paper (4 projects), doing papier-mâché (2 projects), and finally wire sculpture (3 projects). One thing we are really loving about this is that all of my kids are able to work on the projects, from my fairly artistic 15-year-old, to the "I'll do art if you make me" 12-year-old, to the enthusiastic 10-year-old. They've all done well, and they are grasping the concepts. We've enjoyed looking at the examples in the book, which aren't exactly art history but they ARE some great examples of fairly modern art. I think this book would be fabulous for families like mine, where you have kids in multiple age ranges -- elementary, middle school and high school. The projects are doable for younger ages than the 4th grade level that is recommended, especially if they have help. I don't have too many subjects where I can have everyone work together anymore, but the Sculpture books from ARTistic Pursuits are one area where we could do that. Other folks on the Crew reviewed the sculpture books, and some of the regular series. Go check them out!